In books and blogs, I’ve expressed the wish that today’s American filmmakers would widen their range of creative choices. From the 1910s to the 1960s (and sometimes beyond), US filmmakers cultivated a range of expressive options—not only cutting and camera movement but other possibilities too. 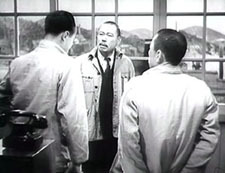 Studio directors were particularly adept at ensemble staging, shifting the actors around the set as the scene develops. You can still find this technique in movies from Europe and Asia, as I try to show in Figures Traced in Light and elsewhere on this site. But it’s rare to find an American ready to keep the camera still and steady and to let the actors sculpt the action in continuous time, saving the cuts to underscore a pivot or heightening of the drama. Now nearly every American filmmaker is inclined to frame close, cut fast, and track that camera endlessly. I’ve called this stylistic paradigm intensified continuity. As Los Angeles agent and former editor Larry Mirisch once put it in conversation with me: “They used to move their actors; now they move the camera.” Most of today’s prominent directors prefer kinetic camerawork and machine-gun cutting. This tends to make their staging rather simple and static: we get stand-and-deliver or walk-and-talk (subject of a blog entry here). The result is a split in contemporary American style. Action scenes are often gracefully and forcefully choreographed (though sometimes the editing fuzzes up character position and overall geography). By contrast, conversation scenes, which could be choreographed as well, are handled either as a Steadicam walk-and-talk or simply as seated actors talking to one another, with cuts breaking up the lines and the camera on the prowl. (I discuss some examples in The Way Hollywood Tells It, pp. 128-173.) (1) You sometimes suspect that today’s directors are most at home shooting lots of people hunched over workstations, making the principal form of suspense a LOADING command. Don’t get me wrong. Like all styles, intensified continuity isn’t a bankrupt option; many fine directors, from the Coens to Michael Mann, have worked vigorous variants on it. What I’m arguing for is more plurality, more tones in the director’s palette. I’ve revived these cranky ideas in discussing a single shot, this time in Variety. Today’s blog entry expands on that brief piece, so you may want to hop over to it here before reading what follows. One task facing any director is to direct—not only actors but us. The filmmaker must direct our attention to what’s important for responding to the drama at any moment. Since the late 1910s, we’ve known that close-ups and frequent cutting do just that. Tight framings and rapid cuts can steer the audience’s attention through a scene. So the question becomes: How can you direct attention without using close views and fast cutting? Well, for one thing you can place the main action in the center of the picture format. If there are several points of interest in the shot, which is usually the case, you can arrange them symmetrically around the central zone of the shot—in film, usually an zone just above the geometrical center of the picture format. You can also position your main players so that the most important ones are closer and/or facing toward the camera. By turning a character away from the camera, you can drive the audience’s eye to someone else. There are other pictorial cues worth mentioning (lighting, color combinations, patterns in the set design), but these will hold us for now. Add in movement—characters shifting their position, especially coming closer to the camera—and you have a suite of cues that a film shot can provide. Apart from these purely compositional factors, you the director can exploit some cues that are part of our social proclivities. When we watch other people, we’re attracted to areas of high information—which, for creatures like us, are faces and hands. Faces send signals about what people are thinking and feeling, with the areas around the eyes and mouth telling us most. Hands are the source of gestures, as well as potential threats. And of course if someone is speaking and others are listening, we are likely, all other things being equal, to look at the speaker. That’s what makes one passage in Paul Thomas Anderson’s There Will Be Blood of interest to me. The scene presents Paul Sunday explaining to Daniel Plainview that there’s oil on his family’s property. Daniel and Paul are bent over a map on a tabletop, with Daniel’s assistant Fletcher Hamilton and Daniel’s son HW watching. 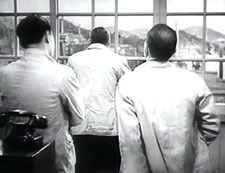 The scene is presented in a single shot, with a slight camera movement forward at the start. The composition could hardly be simpler: four people lined up, three at the edge of the table. The heads cluster around the center of the format, with HW lower and off-center; no surprise that he’s the least important character in the scene (though his question to Paul foreshadows action in the film to come). Paul is explaining where the oil is, and the two men’s faces and hands command our attention as they speak. Many directors would have cut in to a close-up of the map, showing us the details of the layout, but that isn’t important for what Anderson is interested in. The actual geography of Plainview’s territorial imperative isn’t explored much in the movie, which is more centrally about physical effort and commercial stratagems. Questioning Paul about his family, Daniel turns slightly away. This clears a moment for HW to ask about the girls in Paul’s family, and for a moment our attention is steered to the right, to pick up their interchange. Then Fletcher asks about the farm, and as Paul and Daniel tilt their faces to him, he earns his place in the center of the frame. Before, when we could see the faces of the two men closest to the camera, he was subsidiary, but now he becomes salient. On the left, Daniel shifts away uneasily, turning almost completely away from the camera. 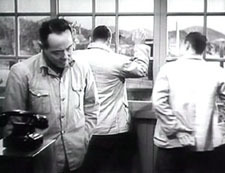 In answering Fletcher, Paul turns away in the opposite direction, as if shy or guilty; his awkward gesture of stroking his hat seems to confirm Daniel’s doubts about him. 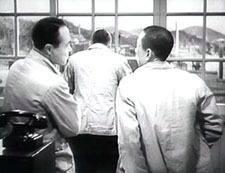 During a pause, Paul turns back to stare directly at Daniel, saying quietly, “The oil is there.” At the same time, Daniel, still turned away, is exchanging a glance with Fletcher. At this point, Anderson’s training of us pays off: we’re ready to detect the slight shift in Fletcher’s eyes, which confirms that Daniel’s looking at him. “Watch their eyes,” as John Ford liked to say. Paul sets out to leave, and he refuses the invitation to stay the night. At this point comes the scene’s biggest gesture. Daniel raises his hand, in the dead center of the frame. 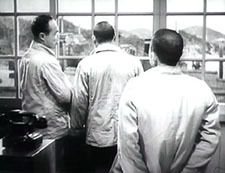 The men watch Paul leave the building. End of scene. Without any close-ups or cutting, Anderson has skillfully steered us to the main points of the scene, which are carried by the performers. 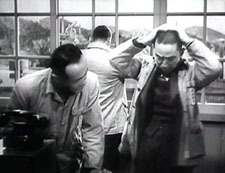 The drama builds through small changes of position, shifts of weight, and facial expressions that accompany the dialogue. (The somber, plaintive music adds an uneasy edge.) Daniel seems more threatening when we don’t see his reaction, and Anderson’s camera forces us to scrutinize Paul’s expressions and body language for signs that this is a scam. It takes confidence to make a raised hand the climax of a scene, but the gesture gains its force by being the most aggressive moment in an arc of quietly accumulating tension. All the principles involved here—frontality, spacing of figures, slight shifts of compositional focus, actors’ body language—are simple in themselves, but they gain a strong impact by cooperating with one another. 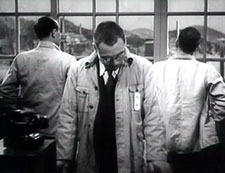 The scene’s quiet obliqueness is characteristic of the film, which, at least until the last few minutes, carries us along with hints about where the action might go and what drives its characters. Yet simplicity shouldn’t imply simplification. Anderson’s willingness to give the shot several points of interest, some more stressed than others, creates an understated tension. The shot’s gravity stems from its conciseness, a quality that Anderson admires in 1940s studio films like The Treasure of the Sierra Madre. The staging strategies Anderson uses aren’t new, as I’ve suggested. They’re part of the history of film as an art form, and many directors have continually relied on them. I don’t think that this is always a matter of influence, although surely filmmakers learned from watching earlier films. Often, directors working within similar constraints intuitively rediscover what other directors have already done. Consider this scene from Kurosawa Akira’s The Most Beautiful (1944). The setting is a plant where Japanese workers, mostly girls and women, are manufacturing bombsights. The workers have vowed to increase production for the war effort, and they are working to the point of exhaustion. The plant supervisors are worried that the pace will take its toll on the girls. The scene starts with the eldest supervisor studying the output chart, lying on a table below the frame edge. His colleagues are turned away, at the window. He is the one who must decide how to keep the girls healthy and the output steady. The table and the window will be the two poles of the action, and the actors will oscillate between them. The process starts when the eldest retreats to the window, and one comes forward to study the report. He’s followed by his opposite number, and they echo one other in rubbing their necks. They’re as tired as the assembly-line girls. Their superior turns and says that there’s no point in lowering the quota because the girls are so devoted that they’d push harder anyway. The men have turned to listen to him, driving our attention to his centered, frontal figure. After the elder has turned away again, the man on the right says that this might be the critical juncture. Remarkably, all three men remain turned from us, creating a slight pictorial tension. This tension is extended when the supervisor on the left states his confidence in the children, their team leader, and their teacher. This makes the eldest turn around. The speaker walks to the window, arguing that the girls will succeed, but the leader turns away again dubiously. He doesn’t offer a decision because an offscreen voice announces that a teacher has come to see them, and they all turn to look. The factory’s problem isn’t solved; the seesawing of the staging has presented that irresolution dynamically. In a single shot, the difficulty of the administrative decision has been expressed in counterweighted movements in and out, by the figures’ frontality and dorsality. Again, it can seem simple, but where a contemporary American director would have given us a prolonged passage of stand and deliver, with intercut close-ups, Kurosawa has created a little ballet out of the men’s uncertainties. Like Daniel’s raised hand, but with even less emphasis, the assistant’s plea on behalf of the girls’ commitment has gained a subtle prominence. Yet all he has done is walk to the window. I’m not saying, of course, that Anderson took the idea from Kurosawa. 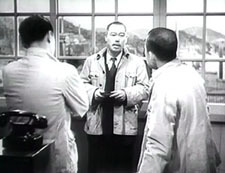 Given the initial choice to stage the scene behind a table, and the inclination to present the action in one shot, both directors spontaneously drew on basic staging principles. This is what film directors have always done. So as a finisher, here’s one last tabletop interlude from Cecil B. DeMille’s Kindling (1915). The entire scene is a dense and intricate affair, but let’s pick just one moment. Maggie has become a servant to a rich woman, Mrs. Burke-Smith, and she’s about to be arrested for theft. Detective Rafferty is ready to handcuff her, but Mrs. Burke-Smith changes her mind. DeMille arranges his actors so that we can’t miss the rich woman’s moment of decision. She is in the foreground, and her face is in the upper center of the frame. The other actors are blocked, so that her expression is the only one we can see clearly at the crucial moment. Her hand gesture, stretching across the central axis of the frame, confirms that she won’t charge Maggie. (For a similar use of “blossoming” actors’ movements in 1910s cinema, go here and look at Figs. 2A10-2A11.) What DeMille knew, Kurosawa discovered afresh, and Anderson hit upon it again. Strategies of staging, like other principles shaping how films tell stories, lie behind each concrete creative decision the film artist makes. They run as undercurrents through film history, almost never discussed by critics. 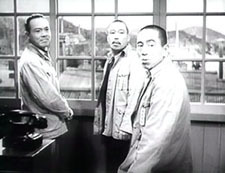 They form a body of tacit knowledge, flowing across our usual distinctions of period, genre, director, national cinema. We can trace continuities and changes, examining how the strategies are revived, revised, or rejected. They can provide us with subtle but powerful experiences. They constitute a skill set that is available to filmmakers today. . . if any will, like Anderson, seize the chance. (1) True, Wes Anderson keeps the camera still, but in his frontal, family-portrait framings the cutting and line readings do all the work; dynamic staging isn’t on his menu. (2) I survey the development of these and other tactics in Chapter 6 of On the History of Film Style. On this site, for one example go here and scroll down to the Bauer material. This entry was posted on Wednesday | February 13, 2008 at 8:22 pm	and is filed under Asian cinema, Directors: Anderson, Paul Thomas, Directors: Kurosawa Akira, Film comments, Film history, Film technique, Film technique: Performance, Film technique: Staging, Readers' Favorite Entries, Silent film. Responses are currently closed, but you can trackback from your own site.